JumpMind provides a variety of product implementation services to fit our customers’ needs ranging from turn-key project delivery to JumpStart consulting to get your own team up and running. Some of our customers are looking to outsource the entire integration portion of their projects so they can focus on application specific functionality and training, while others have a team in place and simply want minimal assistance with installation and design. Regardless of where you fall on that spectrum, JumpMind has services that fit your needs. Get your SymmetricDS and Metl implementations started on the right foot with JumpMind’s JumpStart program. While both products are well documented and straight forward to deploy, sometimes you have a project that’s more complex, or you just want to get up and running fast. 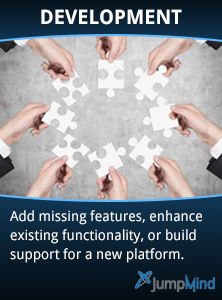 JumpMind’s JumpStart implementations are what you are looking for. Our JumpStart program provides you with expert, seasoned professionals, who have numerous implementations under their belt from smaller, simple implementations to large, complex implementations with customization requirements. Understand the problem domain and product – We’ll spend time with you understanding what you want to accomplish, the timeframe in which you needed it completed, and the resources you have to get it done. We will also review the product and it's features with you, along with the steps needed for an implementation. Design the implementation– We’ll work with you to design the implementation including design, configuration, infrastructure and deployment. Understand any custom development needed – Most situations don’t require custom development. However, if you have unique requirements for functionality or enhancements, we’ll understand those requirements, outline each of them, and provide a high level design for the best way to complete them. Create an implementation plan and estimate – We’ll help you understand the tasks needed, how they should be sequenced, what work is involved in each, and the skillsets needed to complete them. You’ll have a complete understanding of what needs done for an on time, on budget implementation. For those who just want integration projects taken care of, our Turn-Key Project Implementation services allow you to leave all of the lifting to us. We can provide resources including Project / Development management, Integration analysts, architects, developers and testers. We’ll take care of all of your project’s integration needs from source to target. We’ve successfully implemented many integration projects across multiple vertical markets and global geography ranging from a few integrations for small shops to hundreds of integrations across thousands of nodes for multi-national organizations. Regardless of whether your needs are big or small, we have the team that can help. For further information, or to request a quote for a JumpStart, please contact us!